College Football is filled with anomalies and noise. Lots of anomalies and noise. It is the only North American sport that does not decide it’s champion with a playoff. There is a preseason poll that for all intents and purposes is just plain silly. The University of Arkansas was ranked in the top 10 at the beginning of the season because of what they did last year and the players they had returning this year. They were however missing one major piece, their head coach. Bobby Petrino got fired earlier this year and was replaced in the short term by John L. Smith. They are currently 1-3 and two of the losses include an upset lose to Louisiana-Monroe (ULM) and a behind the woodshed beating by Alabama. Meanwhile ULM is a very competitive 1-2 and they scared the living daylights out of Auburn (who they took to overtime a week after beating Arkansas) and Baylor (47-41 final). Ohio University is 4-0 with a win at Penn State and Louisiana Tech is unbeaten, currently averaging 55 points per game and is probably going to beat another big school this weekend on the road (they play at Virginia and have already beaten Houston and Illinois on the road). Why aren’t these teams ranked? How could everyone be so wrong about Arkansas? Is the Big Ten really that bad? It’s the old saying, past performance does not guarantee future success. Preseason College Football polls should be done away with. The first poll should come out the first week of October after the teams have had a few games to prove themselves. It won’t even effect TV ratings. People are going to tune in for Alabama v Michigan anyway because it’s two big named schools. People will be watching Nebraska v UCLA because it’s two big name schools. Does anyone see a pattern developing here? When the first poll comes out it won’t be all that different then it is now. Most people would have believed in preseason that Alabama was the best team in College Football and that that would be a pretty safe bet. Turns out that they would be right, at least by my estimation. Alabama will probably compete for the National Championship again this year so what does it matter if they are preseason #1 in the August? For the smaller programs out there or the teams trying to get into the National Championship picture, being ranked would help get attention and probably help raise money too. But rank them in the first week of October. Not the first week of August. Coaching changes are nothing new in football. In the professional ranks, replacing a coach in the middle of the season isn’t ground breaking but in college, it’s pretty earth shattering. More importantly the cracks are there for it to happen more often. After a 30-13 at home in Week 1 the University of Houston fired their Offensive Coordinator. After a 10-7 loss at Oregon St the University of Wisconsin fired their Offensive Line coach. 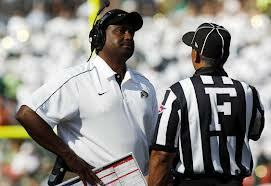 Before a battle against Washington the Portland State Vikings relieved their Defensive Coordinator of his duties. This is an unprecedented rate in college football. The results haven’t been good for any of the three schools since the move. Houston has yet to win a game, Wisconsin had to rely on a missed Utah State field goal at home for a W and Portland State got taken behind the proverbial woodshed by Washington in Seattle. Two of the three coordinators were in their first season with the schools and to last a grand total of three games is mind boggling. Coaching changes happen a lot. The past few offseason’s they seem to be happening later and later giving coaching staff’s even less time together before coaching in the limited time frame that is college football. It’s also giving them less time to recruit fickle high school athletes. If Coordinators are being fired so quickly at the start of the season what does that mean for the Head Coaches at the end of the season? After three weeks you could argue that the SEC could see as many as four coaching changes by the end of the year. Is it too far off to believe that a Head Coach could be fired after game four or five? We’ve already seen it last year in the PAC-12 when Arizona kicked Mike Stoops to the curb after a 1-5 start. This time the change will either be in the SEC or a mid-major conference like the Mountain West or Conference USA. While this is still college athletics it’s about as much of a business as you can find. When a school like Colorado in a major conference like the PAC-12 gives up 55 points by halftime against a school from the WAC you have to think that the Athletic Director and even the school President have to look at making a change. If I was alumni or a major donor the last thing I would do is give money to a school that gets embarrassed like that. If I was quality player I would reconsider my options. Whether you like it or not college football is a major promotional tool for the school. It’s also a massive revenue generator. If the football team is being upset by a smaller school or being blown out on national TV it hurts the school financially. Head Coaches are on the hot seat like never before and they better realize it. If the losing continues after the assistants have been let go there is no one left to pin the blame on. 2012 may end up being the year the flood gates opened on in season firings. The other Tommy John question. The Washington Nationals famously shut down their pitching ace Stephen Strasburgh. The Nationals announced they were shutting him down earlier in the season because of the Tommy John surgery he’s still recovering from and since then there has been a whole lot of noise about whether it’s right or wrong. However, not a lot of people are talking about Kris Medlen’s comeback or what the San Francisco Giants are going to do about closer Brian Wilson. Medlen is gaining a lot of exposure about how the Atlanta Braves rehabbed him and how well he’s doing. In fact the Braves have now won the last 20 games in which he has started. Another big question out there is how will the Giants treat their All-Star closer Brian Wilson when he’s ready to comeback? 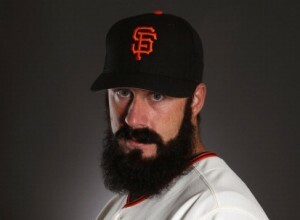 Wilson, aka Fear the Beard, aka Willie, has had Tommy John surgery before. It was done back when he was at LSU. So unlike Strasburgh and Medlen, Wilson is older and having to do this for a second time. Unlike Strasburgh and Medlan, Wilson is a closer and only pitches an inning or an inning and a half so the Giants don’t have to have to rehab him like a starter. They don’t have to worry about him being able to pitch six or seven innings like the Nationals and Braves did with their pitchers. Wilson is also a veteran. He’s won a World Series. He’s been to a few All-Star games but he’s also 30. That last point alone begs the question, ‘will he be able to recover like these younger pitchers?’ The surgery Wilson, Strasburgh and Medlan had is named after the pitcher who first had the surgery, Tommy John. John had the experimental surgery at the age of 31 and pitched until the age of 46. If your a Giants fan that’s good news. However John had the surgery once not twice by that age. Baseball is a physical sport. It’s a marathon and probably more physically demanding for pitchers. The overhand throwing motion is not a natural motion for the human body. While it’s amazing science to have a tendon replaced it’s probably even more amazing to return to throwing a baseball at high velocity in front of thousands of people. What this really comes down to is the pitchers state of mind. If Wilson can stay positive and overcome the mental rigors of rehab then Giants fans have reason to hope. If for some reason he can’t then the Giants may have to find a longer term solution to closing baseball games than Sergio Romo and Javier Lopez. Most College Football programs schedule their out of conference games early in the year and generally during the first few weeks. While some schedule the proverbial cupcake and others try to take on another big name program most try to go with the safe route. The safe route includes programs from the mid-major conferences like the MAC or Conference USA. On paper it looks like a solid strategy but in reality it can end up costing you a major bowl game at the end of the year. Three programs that would be considered a mid-major even though two of them are not in a conference are the Academy schools, Air Force (Mountain West Conference), Army and Navy (both Independents). All three of these programs run the triple option offense which is based on misdirection, angle blocking and more importantly execution. You’ll see a lot of times these Academy schools scheduled at places like Michigan, Penn State, Tennessee, South Carolina, and Oklahoma. Even more often then not you see these Academy schools giving these big time College Football programs all they want in week two or three. For example in 2011 Navy lost at South Carolina by 3 points. In 2006 Tennessee squeaked by Air Force with a 1 point victory in Knoxville and Army lost by 4 points at Texas A&M in 2008. The reason these games and others are so close is that it is so hard to prepare for these offenses and the sheer grit of the the players. If you’re a major program you have a very limited window to prepare your defense for an offense that you see only every couple of years. The defense has to be disciplined, stick with their assignments and tackle very well. The minute they don’t, this offense can break off a big play. Former Notre Dame and current New Mexico coach Bob Davie said multiple times while a commenter for ESPN that the triple option was the hardest offense to defend in all of College Football. You have to remember, you’re asking 18-23 year olds in College to buckle down, be disciplined and stay on their assignments. You’re also asking them to do this the week after their first game where they may have blown out some cupcake or been throttled by another big program. The offense isn’t the only thing these Academy schools have going for them. They are training the military leaders of tomorrow and that is something that an opponent cannot prepare for. These Academy schools are not going to quit. You saw this no quit attitude this past Saturday in Ann Arbor, Michigan where Air Force was on the verge of upsetting a top 25 program in Michigan. 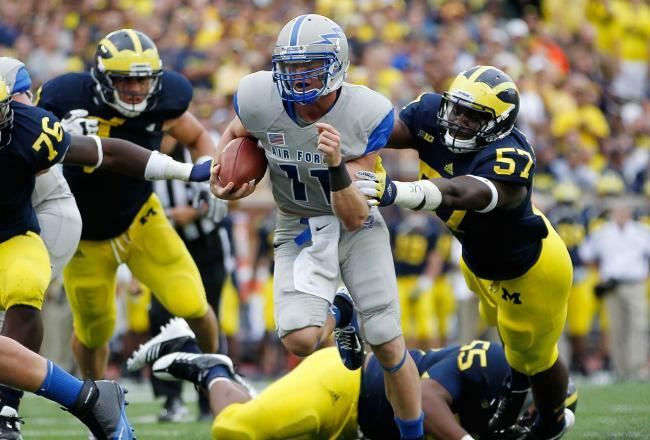 Michigan ended up winning 31-25 but Air Force had an opportunity to take the lead at the end of the game. Some programs do better at defending this offense than others because they see it more often or have more time to prepare for it. Georgia Tech runs the triple option with much better players than the Academy schools but they play the same teams in the ACC year after year so those programs see the offense on an annual basis. College Football is always changing with very few constants. One of those constants is the triple option at the Academy schools. Why big time programs continue to schedule them in weeks two and three I’ll never know. If you are going to play them, take them in week one or after a bye week so that you have more time to prepare or else live the possibility of either a loss or an extremely close game that could end up costing the program millions of dollars in bowl money at the end of the year. When Comcast purchased NBC from GE you knew some changes were coming. Versus turned into the NBC Sports Network which now broadcasts MLS matches and CFL games. But as much as things change they always stay the same. NBC Sports continues to put themselves before the fan and the viewer. NBC broadcast the first NFL game of the season between the Dallas Cowboys and the New York Giants. They star this by dragging out a 90 minute pre game show and right when you think they’re going to kick the ball off they give us an open telling us who the Producer and Director of the show are. They then drag it out a little more with the commentators giving us….I don’t know, more insight I guess. They do the same thing with MLS on the NBC Sports Network. It’s says that kick off is at 4pm but in reality the ball is being kicked off at 4:30. Meanwhile fans and players are left standing around as NBC tries to educate us some more. Here’s a news flash NBC, KICK THE DAMN BALL OFF. No one cares who the Producer or Director is, and I come from a world where I may know these people. I’m not here for a rock concert or a highlight show or pre game interviews. I’m here for a game. The kicker to all of this is the flat out pandering of the broadcast. Guys it’s a second half not a second act (actual graphic). This is a football game not a Shakespearean play. I know Toyota is a big sponsor but I can go without the extended commercial with Eli Manning at halftime. Now NBC Sports is not all bad. They do do some innovative things like streaming the Sunday Night Football game online with multiple camera angles or placing the color commentator on the sidelines of MLS matches. He’s right between the benches and can give more insight on tactics and the momentum of the game. While they have been innovative they also take massive steps backward with just boneheaded maneuvers. I hate to tell NBC this but I’m not watching The Voice so stop showing me ads for it. I’m here to watch football or soccer and I know I’m not alone. I understand why MLS will go along with what NBC wants to do because it’s helping the MLS gain more viewers and they are still trying to gain a significant foot hold in the American sports spectrum. Why the NFL does I don’t know. The NFL recently made a rule stating that if you get thrown out of game you’ll have to go through a class to be allowed in the stadium again. I suppose they’re trying to make the NFL game a more family oriented environment but if they are trying to do that then why do they allow NBC to kick the game off at 8:30pm EST on a school night? I can’t criticize NBC when it comes to the Olympics because I didn’t watch them. Why? Re-read the above. If NBC screws up the NFL and MLS why would I trust them to broadcast the Olympics? NBC can fix these things. It’s not hard but they have to first get off their high horse and stop thinking that ‘they know what people want to see’ cause they don’t. I want to watch sports and if you’re not going to show it to me then I’ll just watch a channel that will. Norm Chow is one of the legendary offensive minds in college football. He has been a very successful offensive coordinator at several schools from BYU to NC State to USC. 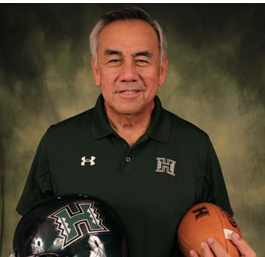 He is now the head coach at the University of Hawaii. His first game was a 49-10 thrashing by his old employer USC and it won’t be the last blow out he’ll experience. Hawaii has had some success in college football. In 2007 they went undefeated and made it to the Bowl Championship Series (BCS) and played in the Sugar Bowl against Georgia. They spent thirteen years in the Run & Shoot offense which was installed by former Head Coach June Jones back in 1999. Norm Chow has installed his own pro style offense. For those not in the know, there are some big differences between the Run & Shoot and a pro style offense. The Run & Shoot uses four wide receivers (WR) and no tight-end. The pro style offense traditionally runs a TE and two running backs (RB). The Run & Shoot worked at Hawaii for several reasons. The most prominent being, in my view, that you don’t necessarily need to out muscle the defensive line on the line of scrimmage. The offensive line mainly pass blocks and doesn’t need to blow the defensive line off the ball at the point of attack like you do with a run heavy offense. You also don’t need to find great TE’s or several RB’s. You need to find several fast WR’s which are easier to find. Finding speed is usually easier than trying to find speed and size. It’s not that you’re giving up on finding speed and size but if you’re at Hawaii you have to use the resources available to you. Just like the Academy schools Army, Navy and Air Force. They use the triple option attack. Why? It’s based on misdirection, execution and angles. Doesn’t that sound like any classic war plan and who better to carry that out then future military leaders. Chow is trying to fit a round peg in a square hole. Finding a pro style QB to go to Hawaii is going to be a challenge in and of itself. Finding and offensive line that can plow the road for an NFL style RB, that may prove to be impossible. Hawaii is not a powerhouse program and their facilities have apparently been lacking. The latter was one of the reasons why June Jones left for SMU after the ’07 season. These things and the sheer distance of Hawaii from the mainland makes finding talent and convincing them to come to the islands a massive challenge. Chow may very well succeed. Expectations are lower at a school like Hawaii then they are at some of Chow’s previous jobs but winning is winning. Chow’s best chance for winning was with an offense that capitalized on the resources available and not on the dreams of what might be.